Point-of-care testing (POCT) is worldwide spreading throughout health-care systems. POCT is defined as medical testing at or near the site of a patient by specially trained health-care professionals in order to increase the likelihood of timely diagnosis, monitoring, and treatment. POCT tests include widely used fast and easy to perform measures such as serum glucose and hemoglobin levels. Other tests include arterial blood gas analysis, activated clotting time, and cardiac markers in more specialized areas, such as intensive care units and cardiac catheterization. Operators of these tests are usually nursing personnel, respiratory therapists, anesthesia, or cardiac catheterization technicians. More complex POCT tests are included, for example whole-blood assays. Currently, there are two types of whole-blood assays commercially available; thromboelastogram (TEG) and rotational thromboelastography (ROTEM). Both have in common, that in the presence of an activator, the viscoelastic changes in the whole-blood sample are measured throughout the entire clotting process. 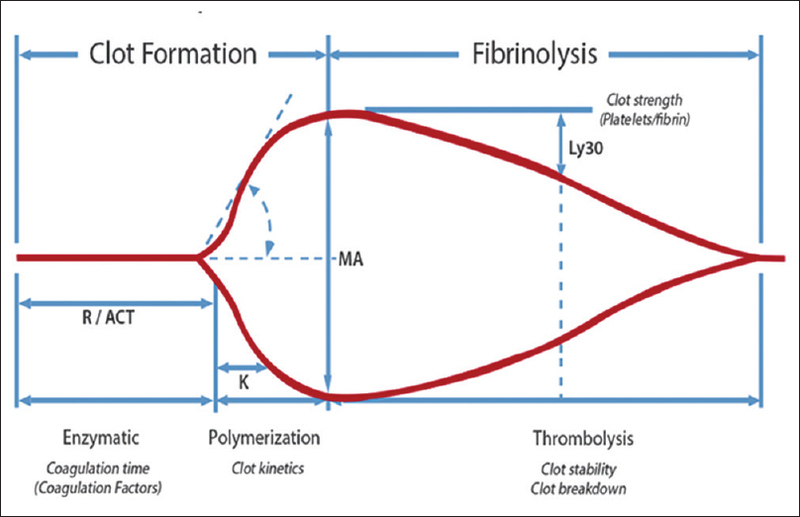 Both systems display graphically the initiation of the coagulation, clot formation, and fibrinolysis. Both tests are usually performed by laboratory personnel. So far, the use of TEG system in trauma surgery has not been described in the Arab Middle. Herein, we discuss the initial experience for implementation of TEG in the only Level 1 trauma center in Qatar. Under the auspices of The World Academic Council of Emergency Medicine and in conjunction with Hamad Trauma Center (HTC), we undertook this pilot project at our center with a vision to develop a Global Trial on point-of-care thromboelastography. The HTC is the only national Level 1 tertiary trauma center in Qatar, with the capability to deliver high-quality, evidence-based advanced treatment needed for polytrauma patients with state-of-the-art life support facilities. The HTC trauma registry is a mature database, that was established in 2007. This trauma registry is compliant with both the National Trauma Data Bank and Trauma Quality Improvement Program [TQIP] of the American College of Surgeons-Committee on Trauma. In HTC, it has been agreed to use a combination of MTP, which had been implemented already in 2010 and TEG-guided therapy. Therefore, the already existing hospital policy for TEG from Qatar's heart hospital has been taken over from the Heart Hospital as a basis or initial draft which has been immediately modified according to the Danish protocol before implementation. According to this protocol, an action is required in the form of transfusing 1 unit fresh frozen plasma (FFP) when the R-time is between 14–21 min and 2 units when FFP is between 21–28 min, and 4 units FFP when the R-time is prolonged by >28 min. One pooled platelet concentrate is given when the MA is shorter than 48 mm and 2 pooled platelet when MA is <40 mm. Guided by a Danish TEG protocol, the heart hospital protocol was modified concerning the functional fibrinogen level (which is not routinely used in cardiac surgery). The R-time cutoff in Copenhagen is 10–14 min, treated with 10–20 ml/kg FFP and in a prolongation of >14 min with 30 ml/kg FFP. The range for Kaolin TEG MA is between 45 and 49 mm requiring 1 platelet concentrate or 5 ml/kg. Below 45 mm, 2 platelet concentrates or 10 ml/kg is required. The TEG treatment algorithm from Copenhagen sets the cut-off value for functional fibrinogen MA is set < 14 mm. Treatment options given are either 20 ml/kg FFP or cryoprecipitate pool (3–4 ml/kg) or fibrinogen concentrate (adults 1–2 g). 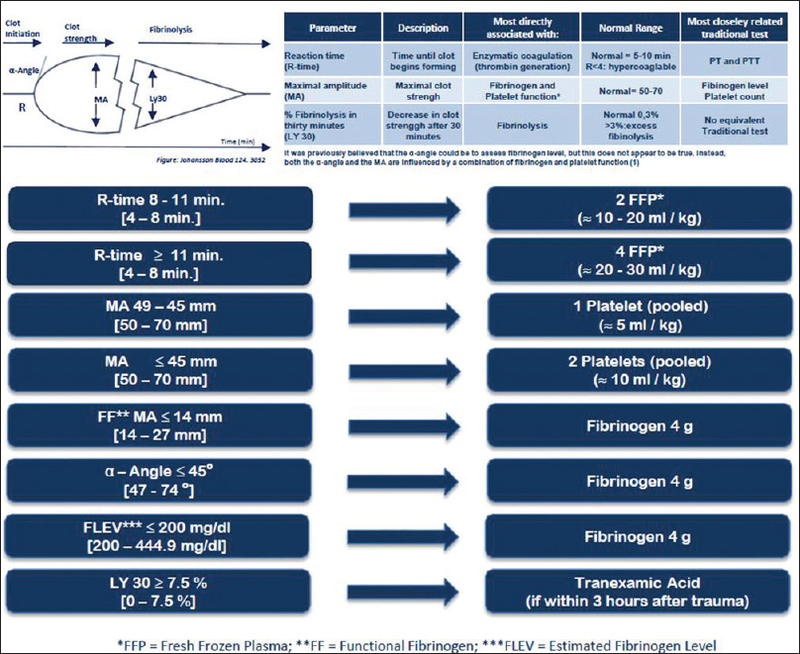 The relevant parts of the Danish protocol which have been included in the “Hamad General Hospital (HGH) – Trauma Surgery-TEG Protocol” involved the Kaolin TEG MA as well as the functional fibrinogen MA cut-off values and therapy recommendations [Figure 1]. The HGH-Trauma surgery has developed the TEG-guided blood component therapy algorithm for the management of bleeding and coagulopathy associated with severely injured patients. TEG operators are usually either trained by a representative from the manufacturer, through self-instruction modules, institutional instructors, or in combination. The minimal requirements in our trauma center are the training provided by a representative from the manufacturer. This is followed by a written test. A general refresher course from the point-of-care team is repeated on a regular basis in a 6-month interval. It is known to be less time-consuming, effective, and consequently less expensive for the institution. However, the regulatory agencies require that the initial training and ongoing competency training to be documented. An alternative approach is an institutional instructor, which is usually more expensive and time-consuming. To increase the quality of service, a synthesis of both approaches has been chosen. In an initial phase, a small number of physicians was selected. This group of physicians included anesthetists as well as trauma surgeons with previous knowledge in POCT-TEG. They shared the daily routine operational issues regarding concerning the quality control of the TEG® 5000 system, first the handling of Kaolin samples, and roster preparation concerning the daily TEG quality control as well as ordering the consumables over a period of 3 months. Subsequently, this group trained other colleagues from trauma surgery and associated anesthetists up to a total of 10 physicians. The total number of 10 has been chosen to make sure that nobody loses his skills due to lack of routine as the quality control in the TEG® 5000 system still is a complex procedure requiring constant training. A number of at least 10 skilled and trained physicians are needed to make sure that a 24/7 service could be provided. Each new member joining the “TEG-group” has to perform at least 10 supervised and documented TEG Quality Controls (QCs) within a period of 12 weeks. Following that he/she has to undergo a practical test which holds by one of the four team members of the pilot group. This test is performed according to checklist, which has been prepared according to manufacturer standards and agreed on in advance. A similar procedure has been developed for patient samples. To further raise the standard and quality, the concept of quality assurance for the “TEG in Trauma Surgery at Hamad General Hospital” was guided by the previous experience in performance improvement program and as the European health-care quality manager. Weekly control and monthly statistics concerning the daily quality control have to be performed at a regular basis. A similar PDCA project was started with a respect to the patient samples. We describe our TEG model in which the education, training, and service have been developed; without exception, only physician-based consultants, senior consultants, and Trauma Surgery Fellows. The main difference between TEG and ROTEM is simply technical that in TEG the rotating pin is suspended in a stationary cup, while in ROTEM, the pin is stationary and the cup is rotating. In the TEG system, the coagulation starts the force transmitted to the pin is detected and electronically transmitted to a computer, where it is displayed as a graph. The time until coagulation starts is displayed as “reaction-time” (R-time). This value will be prolonged in the presence of coagulopathy and shortened in patients in a hypercoagulable state. The elapsed time from the beginning of clot formation until a fixed level of clot strength (defined as amplitude of 20 mm) is detected is called K-time. It is a parameter of the speed at which a clot achieves this level of firmness. Fibrinogen deficiency prolongs K-time, whereas increased fibrinogen level or hyperreactive platelets may shorten this parameter. The alpha-angle reflects the speed of fibrin accumulation and polymerization and is closely related to K-time. The “maximum amplitude” (MA) reflects the clot strength. It is mainly represented by fibrinogen and platelets. Finally, the LY-30 represents the percentage of the clot that has dissolved at 30-min time. [Figure 2] shows graphical display of a normal TEG (http://teg. haemonetics. com/en-gb/). A recent meta-analysis assessed the benefits and harms of TEG-guided or thromboelastometry (ROTEM)-guided transfusion in adults and children with bleeding. The authors concluded that there is a growing evidence that application of TEG- or ROTEM-guided transfusion strategies may reduce the need for blood products and improves morbidity in sick patients with considerable bleeding. However, when a new POCT implementation, especially one of the more expensive and complex test is considered, several questions have to be answered. The most important question is whether it is going to change the current practice or not? By trend, the number of major Level I trauma patients activations is slightly increasing since 2013. [Figure 3] shows the total number of Level I activation of massive transfusion protocols (MTPs), transfused packed red blood cells (PRBC), FFP, and pooled platelet concentrates in trauma patients per year. Analysis of the number of major Level 1 activation per year and used blood products in trauma patients revealed the trend of the annual increase since 2013. Therefore, the implementation of a viscoelastic whole-blood assay in order to control the utilization of blood products by goal-directed use was imperative. Consecutively, the frequency of potential side effects for patients receiving blood products would automatically decrease. In addition to that, the cost of administering large amount of blood products and the preparation as well as supply with high-quality blood products will be appropriately addressed. Moreover, reports showed evidence that the use of protocols like MTP, especially in combination with point-of-care-tests such as TEG or ROTEM will decrease the use of blood products and costs. However, the implementation and outcome after TEG may differ from country to country or even from hospital to hospital. In calculating the cost of running a TEG 5000 properly, several facts have to be taken into consideration. The most important factor in this calculation is the consumables. For the daily quality control, a Level I as well as a Level II control has to be done. End price for one Level I control is 28 US $. In addition, two plain cups are needed, each costs 12 $. Exactly, the same amount has to be spent on Level II control. In the end, the upcoming costs mount up to 103 $/day. In addition, for each kaolin patient sample that is performed, an average cost of 549 $ is generated. The Transfusion Medicine at Hamad Medical Corporation includes donor collection, component production, patient transfusion, and therapeutic apheresis services in Qatar as the sole provider. Blood components fully comply with the latest Council of Europe (Conformité Européene”) standards and are prepared using the Terumo BCT (https://www.terumobct.com/) Reveos automated component processing system. All components are leukodepleted to <1E6 residual white blood cells. Platelets (both apheresis and pooled) are pathogen-inactivated with riboflavin (Terumo BCT Mirasol) and suspended in platelet additive solution (TSol, Terumo BCT). Plasma is also pathogen-inactivated by the riboflavin system. Qatar's blood production is optimized for safety (greatest pathogen reduction after donor infectious disease testing, including nucleic acid test) and speed so that all acceptable components are released in <1-day postcollection. To produce components (i.e., packed RBCs, platelets, and plasma) from one whole-blood donation, it costs in excess of 544 $. Similarly, apheresis derived plasma or platelets from one donor costs in excess of 544 $. 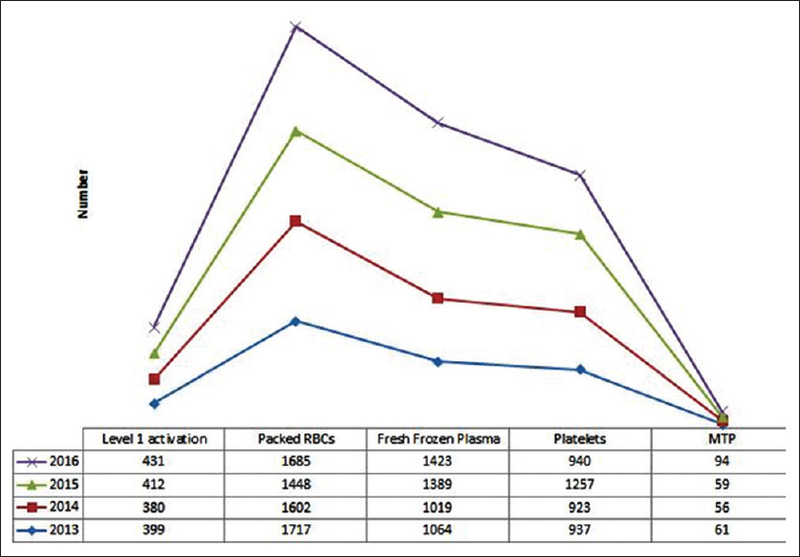 During an activated MTP, blood products are delivered in “shipments” of 6 PRBCs, 6 FFP, and 6 pooled platelets (PLTs). The annual costs for daily quality control of the TEG add up to 57 916 $. With an average production cost of 544 $ per blood product, 69 units of blood products annually must be saved to adjust costs of the quality control to zero. Most studies concerning the amount of used blood products pre- and post-implementation of TEG or ROTEM have been conducted in the cardiac and liver surgery. For example, Hvas et al. found that the use of PRBCs (31.7% vs. 29.3%) and Factor VIIa had decreased significantly. No difference was found in the use of FFP (24.9% vs. 22.7%) and platelets (25.5% vs. 21.7%), whereas the use of fibrinogen increased (3.6% vs. 11.6%). Slightly different findings have been reported in 2011 by Gorlinger et al. They found a significant decrease in PRBCs (49.7% vs. 40.4%) as well as FFP (19.4% vs. 1.1%) with a nonsignificant increase in the use of platelets (10% vs. 13%). However, in this study, an increase in the total amount of fibrinogen used was described. In 2006, Anderson et al. described a reduction in PRBC use from 60% to 53%, FFP (17% vs. 12%) and platelets (16% vs. 11%), respectively, in cardiac surgery. However, in terms of the budget impact, saving is to be expected with the use of TEG. With reduction of utilized blood products, the total number of transfusion-associated side effects will decrease. Accordingly, there will be a decrease in the hospitalization costs. In addition, the reduced total number of blood products will lead to overall reduction in production cost. A study conducted in a German center for liver transplant, similar to the cardiac surgery setting, found a reduction of cost for blood products of 59% after implementation of ROTEM. Nevertheless, there was a remarkable increase concerning the costs of coagulation factors. However, the overall cost-saving for the hospital during the studied period was 35%. The same study group calculated an overall cost-saving of 6.5% in cardiac surgery before and after implementation of ROTEM. Another group proved in the setting of cardiac surgery an overall cost reduction of 44%. Additional challenge during implementation of TEG system is the fact that TEG-based cut-off values are not well validated and are arbitrarily assigned. Furthermore, cut-off values from obstetrics, liver transplant surgery, and cardiac catheterization or surgeries are not necessarily the same as for trauma patients. Accordingly, the developments of unique flowchart or protocol may need to be individualized. The clinical evidence of bleeding or oozing pre-, intra-, and postoperative should be used in accordance with the hospital-specific guidelines, including preexisting MTP, individual experience, and serial measurement of TEG. All these factors in combination with conservative laboratory parameters, including, for example, the usually taken platelet counts, body temperature, and pH status should guide the therapy of a present coagulation disorder. The key element in implementing a new POCT protocol, independent of hospital or manufacturer requirements, is the “quality control” (QC) program. This may vary by institution, analytic, technology, and regulatory agency. However, at a minimum, the CLIA of 1988 (CLIA ’88). requires that QC should be performed on the day of patient testing. Nevertheless, the frequency of QC testing outlined by the regulatory agencies is the minimum amount of QC testing acceptable. Based on good laboratory practice, the volume of patient testing, experience of testing personnel, and confidence of the laboratory director, some hospitals may choose to perform QC testing more frequently, acknowledging that there will be an increase in the cost of reagents. TEG is a promising tool in trauma patients with a potential compromised coagulation. However, further prospective research projects and well-trained personnel still warranted. We thank all the staff of Hamad General Hospital POCT and trauma section, Qatar. da Luz LT, Nascimento B, Rizoli S. Thrombelastography (TEG®): Practical considerations on its clinical use in trauma resuscitation. Scand J Trauma Resusc Emerg Med 2013;21:29. Muzaffar SN, Baronia AK, Azim A, Verma A, Gurjar M, Poddar B, et al. Thromboelastography for evaluation of coagulopathy in nonbleeding patients with sepsis at intensive care unit admission. Indian J Crit Care Med 2017;21:268-73. Hunt H, Stanworth S, Curry N, Woolley T, Cooper C, Ukoumunne O, et al. Thromboelastography (TEG) and rotational thromboelastometry (ROTEM) for trauma induced coagulopathy in adult trauma patients with bleeding. Cochrane Database Syst Rev 2015;2:CD010438. Hanke AA, Horstmann H, Wilhelmi M. Point-of-care monitoring for the management of trauma-induced bleeding. Curr Opin Anaesthesiol 2017;30:250-6. Rossaint R, Bouillon B, Cerny V, Coats TJ, Duranteau J, Fernández-Mondéjar E, et al. The European guideline on management of major bleeding and coagulopathy following trauma: Fourth edition. Crit Care 2016;20:100. Gonzalez E, Moore EE, Moore HB. Management of trauma-induced coagulopathy with thrombelastography. Crit Care Clin 2017;33:119-34. Schochl H, Nienaber U, Hofer G, Voelckel W, Jambor C, Scharbert G, et al. Goal-directed coagulation management of major trauma patients using thrombelastometry (ROTEM)-guided administration of fibrinogen concentrate and prothrombin complex concentrate. Crit Care 2010;14:R55. Coakley M, Reddy K, Mackie I, Mallett S. Transfusion triggers in orthotopic liver transplantation: A comparison of the thromboelastometry analyzer, the thromboelastogram, and conventional coagulation tests. J Cardiothorac Vasc Anesth 2006;20:548-53. Rahe-Meyer N, Solomon C, Winterhalter M, Piepenbrock S, Tanaka K, Haverich A, et al. Thromboelastometry-guided administration of fibrinogen concentrate for the treatment of excessive intraoperative bleeding in thoracoabdominal aortic aneurysm surgery. J Thorac Cardiovasc Surg 2009;138:694-702. Shore-Lesserson L, Manspreizer HE, DePerio M, Francis S, Vela-Cantos F, Ergin MA. Thromboelastography-guided transfusion algorithm reduces transfusions in complex cardiac surgery. Anesth Analg 1999;88:312-9. Kashuk JL, Moore EE, Le T, Lawrence J, Pezold M, Johnson JL, et al. Noncitrated whole blood is optimal for evaluation of post injury coagulopathy with point-of-care rapid thromboelastography. J Surg Res 2009;156:133-8. Kashuk JL, Moore EE, Saeyer M, Le T, Johnson J, Biffl WL, et al. Post injury coagulopathy management: Goal directed resuscitation via POC thromboelastography. Ann Surg 2010;251:604-14. Borgman MA, Spinella PC, Perkins JG, Grathwohl KW, Repine T, Beekley AC, et al. The ratio of blood products transfused affects mortality in patients receiving massive transfusion at a combat support hospital. J Trauma 2007;63:805-13. Holcomb JB, Wade CE, Michalek JE, Chisholm GB, Zarzabal LA, Schreiber MA, et al. Increased plasma and platelet to red blood cell ratios improves outcome in 466 massively transfused civilian trauma patients. Ann Surg 2008;248:447-58. Wikkelsø A, Wetterslev J, Møller AM, Afshari A. Thromboelastography (TEG) or thromboelastometry (ROTEM) to monitor haemostatic treatment versus usual care in adults or children with bleeding. Cochrane Database Syst Rev 2016;8:CD007871. Hvas AM, Boas TW, Jensen M, Lindskov C, Folkersen L, Ravn HB, et al. Change in hemostatic intervention after implementation of thromboelastometry. J Cardiothorac Vasc Anesth 2012;26:227-31. Gorlinger K, Dirkmann D, Hanke AA, Kamler M, Kottenberg E, Thielmann M, et al. First-line therapy with coagulation factor concentrates combined with point-of-care coagulation testing is associated with decreased allogeneic blood transfusion in cardiovascular surgery: A retrospective, single-center cohort study. Anesthesiology 2011;115:1179-91. Anderson L, Quasim I, Soutar R, Steven M, Macfie A, Korte W, et al. An audit of red cell and blood product use after the institution of thromboelastometry in a cardiac intensive care unit. Transfus Med 2006;16:31-9. Spalding GJ, Hartrumpf M, Sierig T, Oesberg N, Kirschke CG, Albes JM, et al. Cost reduction of perioperative coagulation management in cardiac surgery: Value of “bedside” thromboelastography (ROTEM). Eur J Cardiothorac Surg 2007;31:1052-7. Hannon T. Trauma blood management: Avoiding the collateral damage of trauma resuscitation protocols. Hematology 2010;1:463-4. Watson GA, Sperry JL, Rosengart MR, Minei JP, Harbrecht BG, Moore EE, et al. Fresh frozen plasma is independently associated with a higher risk of multiple organ failure and acute respiratory distress syndrome. J Trauma 2009;67:221-7. Centers for Medicare and Medicaid Services. Clinical Laboratory Improvement Amendments (CLIA); 2017. Available from: https://www.cms.gov/RegulationsandGuidance/Legislation/CLIA/index.html?redirect=/CLIA. [Last accessed on 2017 Jan 25]. Johansson PI, Stensballe J, Oliveri R, Wade CE, Ostrowski SR, Holcomb JB. How I treat patients with massive hemorrhage. Blood 2014;124:3052-8.